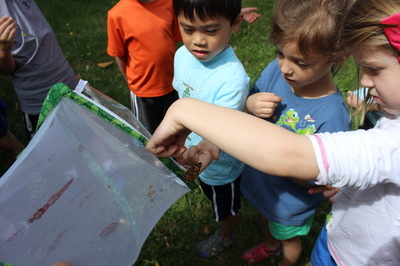 Each Spring, our Kindergarten class raises and releases Butterflies. In their journals, they complete the butterfly life cycle as part of this unit of study. Journal entries completed by our Kindergarten students as they completed their investigation on the rain garden. Our rain garden is the centerpiece of our water module focusing on topics such as erosion, the water cycle, and the Chesapeake Bay ecosystem. At St. Margaret's Day School students at all levels receive environmental education and participate in activities that are integrated with learning, play, and environmental education. ​At all levels, students participate in recycling (and up-cycling), composting, outdoor education, and wildlife. We encourage self-exploration and allow many of the lessons and explorations to be child led. We want the children to be interested and actively engaged, so our focus is on what the students' are interested in. ​All ages are provided a large range of activities and unique opportunities to learn about our environment. In cases where are youngest student aren't quite ready to understand the concepts, the exposure to these ideas and activities is very important at our school. Each year, we work together to decrease our waste, raise and sustain our monarch environment, improve our garden, and grow and nurture vegetables. We are raising a future of children that will continue to love and want to improve the environment around them. This year we have added beet box to our curriculum. Each month, a hands on learning kit including lesson plans, all required materials, and fresh ingredients will be delivered to our school! Every beetbox includes science experiments, planting, cooking, art projects, engineering, literacy pieces, dramatic play options, and more. Beetbox is aligned with Common Core, Next Generation Science Standards, and CDC National Health Education Standards. Each class will experience our beetbox subscription throughout the school year. In the spring, our students plant sunflowers and watch them grow. They then take them home and can plant them in their own gardens. Below is one of our beautiful sunflowers thriving at it's new home! Our Twos and Threes are no strangers to recycling. They have many chances each class to learn about and participate in examining and sorting trash from recyclables, properly disposing of snack and lunch items. The Twos and Threes classes also raise an ant farm each Spring. They learn the responsibility of caring for an animal, as well as the ant life cycle. Our Twos and Threes spend a lot of time outdoors in our newly expanded outdoor learning center. In the outdoor learning center they are able to explore in the garden, learning about different plants, flowers, and herbs. There is a digging box for exploring insects with shovels, buckets, and magnify glasses. Our outdoor learning center is a valued area for enriching our outdoor education. One of our Threes sunflowers from Spring of 2015. By July, the flower was almost as tall as a 6'2" dad! Singing songs is always a fun and engaging piece of our outdoor education! We love trash! In prior years, our threes class have raised praying mantises. They built a habitat for our praying mantises until they are ready to be released onto our school grounds. Our 4's students are extremely excited and engaged in our outdoor learning center. These students show initiative when it comes to composting and recycling. ​Our 4's students raise praying mantises each Spring to release into our garden. They create bird feeders out of recycled materials. Using these bird feeders in our garden, we are able to begin learning to identify different types of birds. Our 4's are also responsible for the care of our red ear slider, Shelly, and caring for our earth worms. Earth worms are an important part of our ecosystem, so raising some in our classroom provides the students with a hands on opportunity to see them breaking down food matter and creating healthy soil. Hands on exploration with our earth worms. Our Monarch release at the beginning of the school year. Our Pre-K students are very much involved in day-to-day enriching activities and good habit building. Our environmental curriculum includes teaching the students energy and water saving strategies, recycling, composting, and exploring the outdoors. They grow and release ladybugs each year, as well as planting native flowers and plants in the garden, and helping maintain our vegetable garden. Our Pre-K students conduct seasonal modules. They learn about climate cycles with emphasis on earth science studies, wildlife, and plant life. In the Fall, they explore apple orchards and learn how leaves change color. In the Winter, they learn about wildlife behavior changes, snow and ice, and where our food comes from. In the Spring, they are able to see how sunlight and warmer weather promote new growth of trees and plants and increase insect and wildlife activity. As part of our DNR partnership, we have been caring for a terrapin named Rosetta. Rosetta calls the Pre-K classroom home. The students love the responsibility of feeding Rosetta. A terrapin unit is included in the Pre-K curriculum when learning about Marylands native plants and animals. 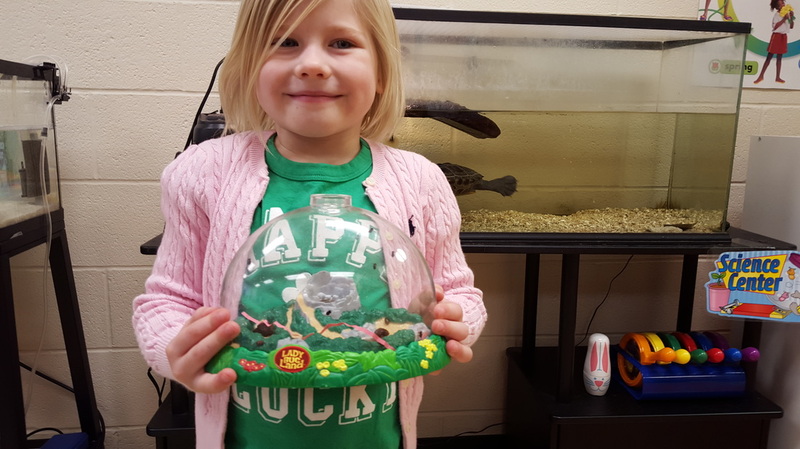 One of our Pre-K students with our ladybugs just before release. Investigating the watershed and runoff. Our kindergarten class has the most rigorous environmental course of study. It is a culmination of all of our daily activities and practices, such as recycling and composting, mixed with intensive units of study on insects, food growth, and trees. All of our special units include fun activities to encourage engagement and include student-directed exploration. ​One of many subjects our kindergarten class has studied is erosion. The students conduct workshops in class with sand, dirt, clay and gravel on a cookie sheet and used eyedroppers and fans to move the earth materials. Additionally, students were able to see one of the ways we can limit erosion with our own campus rain garden. The rocks slow the water flow and collect it while the plants strengthen the soil structures and absorb and retain much of the water. Students worked together to create examples of water runoff, and brainstormed ways to slow or stop the runoff. The Kindergarten class is also responsible for raising and releasing painted lady butterflies each Spring, planting and caring for plants and flowers in our garden, as well as maintaining our vegetable garden. Two fire belly toads call Kindergarten their home. The students are responsible for feeding our toad friends, and complete a unit of study on frogs and toads. Creating erosion models and brainstorming how to eliminate some of the runoff. Our Kindergartners release painted lady butterflies each spring after completing a butterfly unit. Our young scientists elbow deep in pumpkin exploration. Our Kindergarten class completes a unit on healthy eating. During this unit they have a taste testing of the rainbow, complete a vegetable and fruit relay race, play healthy living bingo, and complete the my plate learning activities by sorting foods into the correct groups. St. Margaret's Day School received accreditation from the National Association for the Education of Young Children (NAEYC) in 2014. 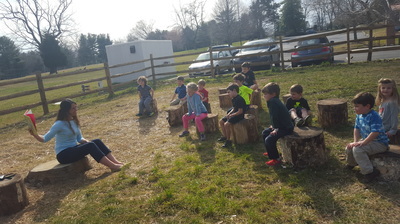 An important part of the accreditation process includes basic requirements for outdoor learning and play facilities, but we are very proud of our environmental accomplishments and are continuing to meet new goals in our outdoor learning center each year.